Kick start your day with a metabolism boosting smoothie that keeps your body full and the cravings afar. A good recipe is to incorporate mango, coconut meat, lime juice, chia seeds and turmeric. This drink has a lot of minerals and vitamins, and can even provide benefit from UV radiation. Summer brings fruits and vegetables that have a high water content. This means that eating them will make you fuller faster and ensure that you eat less calories. This was proven in a study by Penn State where women who ate broth-based soup before lunch consumed fewer calories than women who did not eat the soup. It is a good time to load up on melons, zucchini, strawberries and other summer fruits that will fill you faster. Summer is a good time to eat barbequed lean meat like fish, especially bass. Leans meats like fish are easy to cook and don’t need many sauces or condiments. The best part is you can cook them without butter or oil and can indulge yourself often because they are so light on the stomach—and on the scale. Wean your body off of coffee and enrich your body with antioxidants in the form of green tea. Green tea acts as a mood booster, weight loss aid and greatly increases metabolism. In summers, it also provides good hydration and refreshes the skin. You can add lemon or sweeteners and modify it to your taste. Yogurt helps to improve digestion, boost immunity and it also increases the good bacteria in the gut. It is also a great snack between meals with fruits. In the form of frozen yogurt, it can provide a great and healthy alternative to ice cream. A walk after dinner can help lose more weight, a study has shown. It also gives a chance to burn the calories consumed throughout the day. Compared to people who walk in the morning, walks after dinners are overall more beneficial for the body. Exertion in hot weather also helps burn more calories as the body is exerting energy to balance the heart rate, respiratory rate etc. Just make sure you are hydrated while you are exercising in the summer. 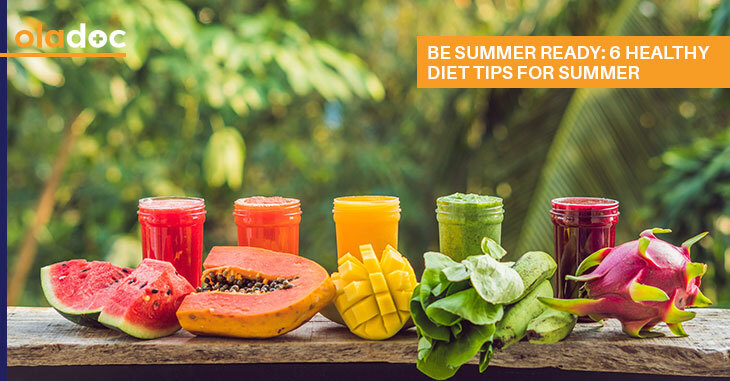 Summers are an ideal time to stay fit and healthier. Do not let the heat bind you to the air conditioner—rather go out and sweat off the heat and the calories. If you need an organized diet chart to help you lose weight in the summer then seek professional help from a dietitian. Book an appointment with a top nutritionist in Lahore, Karachi and Islamabad through oladoc.com, or call our helpline at 042-3890-0939 for assistance to find the RIGHT professional for your concerns. « Dry Brushing For Skin? Its Benefits And How To Use It!